The highly ranked College of Engineering and Sciences, led by outstanding faculty recognized for their expertise, graduates some of the most successful engineers, scientists, healthcare professionals, and educators in the mid-West. Our students receive a rigorous training that enables them to advance their careers anywhere in the world. More than twenty undergraduate and graduate programs divided among five departments prepare you to pursue excellent jobs in the highly sought after STEM fields in the high-tech, data-based 21st century. As an undergraduate or graduate student, you will apply your classroom knowledge to a broad range of basic and applied research and projects, including statistical and computer data analysis, biological and chemical processes, smart technologies, ecology and environmental hazards, designing and building automobiles, bridges, and more. Our engineering departments house one of the leading internationally-recognized groups in steel production improvement. As an engineering student, you will work with multi-disciplinary teams of scientists and engineers from industry and the university. Students in the Department of Biological Sciences enjoy numerous opportunities to work with the faculty on individualized research projects and present findings at regional and national meetings, giving them a competitive advantage after graduation. 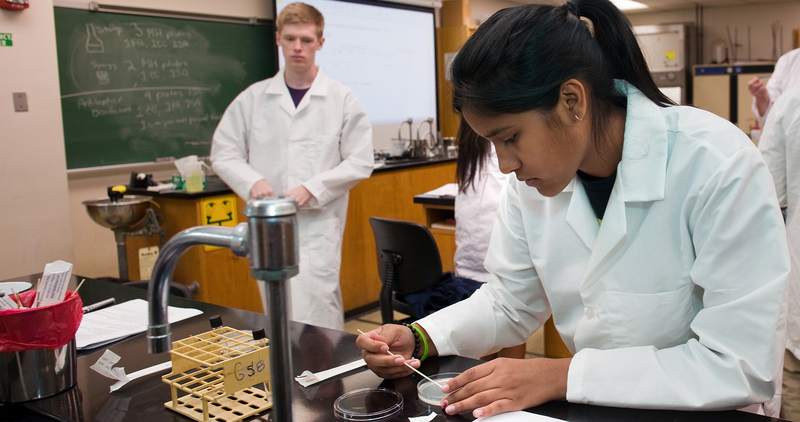 Ninety percent of our Chemistry and Physics students go to graduate school or are employed in their field upon earning their degree. If you intend to become a doctor, dentist, veterinarian, or pharmacist, we offer a variety of pathways to prepare you for success, including concentrations and pathways for all degree options that lead to your professional school of choice. Our graduates are actively and consistently recruited by numerous regional and national companies. Recent graduates have accepted positions at places, such as: Agdia, ArcelorMittal, Fiat Chrysler Automobiles, Ford, General Electric, General Motors, NiSource (NIPSCO), Urschel Labs, and more. Other graduates have recently gone on to graduate or professional school at: Marian University, Midwestern University, Notre Dame, Ohio State University, Purdue University, or stayed right here with us in one of the many graduate programs at Purdue Northwest. These are just a few examples of the opportunities that graduates from the College of Engineering and Sciences are prepared for. Engineering Accreditation Commission of ABET, Inc. (EAC-ABET), 111 Market Place, Suite 1050, Baltimore, MD 21202-4012. phone: (410) 347-7700, fax: (410) 625-2238. http://www.abet.org. American Chemical Society (ACS) 1155 Sixteenth Street NW, Washington DC 20036. https://www.acs.org/content/acs/en/about/governance/committees/training.html. Minors offered at Purdue Northwest .